View Documents Side by Side . . . 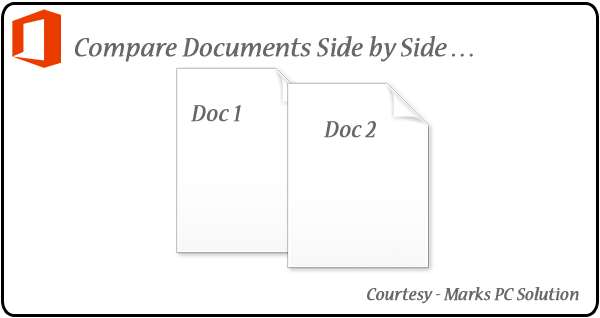 If you work with different types of documents often you may need to compare those files side by side. Microsoft Office (for Word & Excel) has an option to view/ compare documents side by side. Office 2007, 2010, 2013 & 2016. 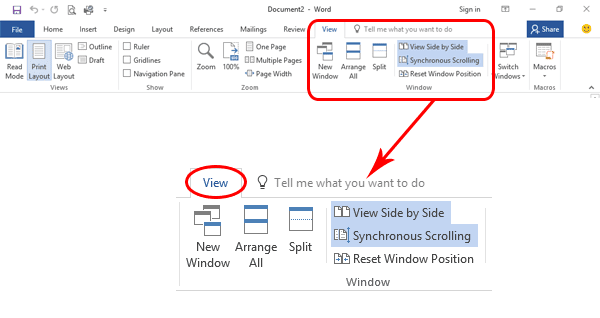 In Word 2003, you have to go to the Window Menu > Compare side by side . . . Remember, two documents should be running to view side by side. This option is usually available for Word & Excel. But in case of PowerPoint, you can view two presentations side by side by Arrange All option from view menu. But in Word & Excel you will directly get this option - View Side by Side. Move to the Window Section. Choose View Side by Side. Also choose Synchronous Scrolling (If you need to scroll both documents at the same time). Follow the image above for better understanding. You can also try the Arrange All option. With this option, you can view two or more open windows at a time.